This is a technical fight that requires 4 tank groups / DPS and dynamically switching tanks during curses. This is a multi-tank fight and requires every person of the raid to be on their toes due to 2 curses. Mob heals every 3 minutes for 402K. Average hit of 5900. 1,000 damage a second. To pull this mob, just have the tank run straight to the back wall, then hook to the left. If you are having issues with AE's on pull, AE Avoid works well on squall and tail lash. DPS should stay off the dragon (lest debuffs and not COB / POTM) until in place. This dragon is a caster so positioning may be semi difficult if you are not used to positioning casters. Once the dragon is in position, full dps and debuffs should start. Periodically throughout the fight you will recieve the 'Mark of Darkness', icon of a Skull and Crossbones (Uncureable) detrimental. This means you can no longer cure / heal / help someone who does NOT have the Mark of Darkness. 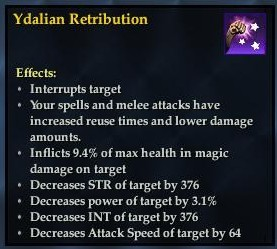 Also, this means you can no longer hit Zarrakon. 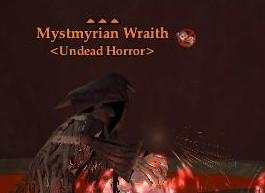 Instead you are forced to DPS and kill a Mystmerian Wraith (Lich). 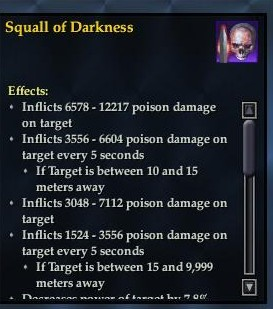 If you have mark of darkness, it is VERY important that you kill the Wraith ASAP. 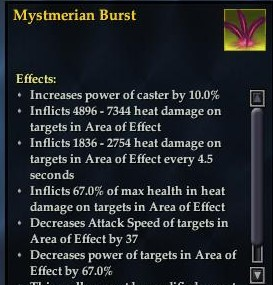 If you do not kill the wraith fast enough, you may get the elemental effect called Mystmerian Burst. This effect is only placed upon the raid when multiple wraitsh are alive. 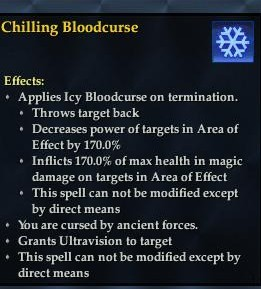 Periodically throughout the fight 2 people will recieve a detrimental effect called Chilling Bloodcurse or Spiteful Bloodcurse. 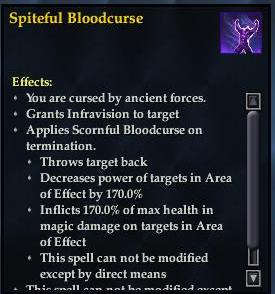 Chilling Bloodcurse Grants Ultravision (purple vision) when you recieve the effect. Your job is to make it to the purple pool (marked in the diagram below) within 25 seconds. 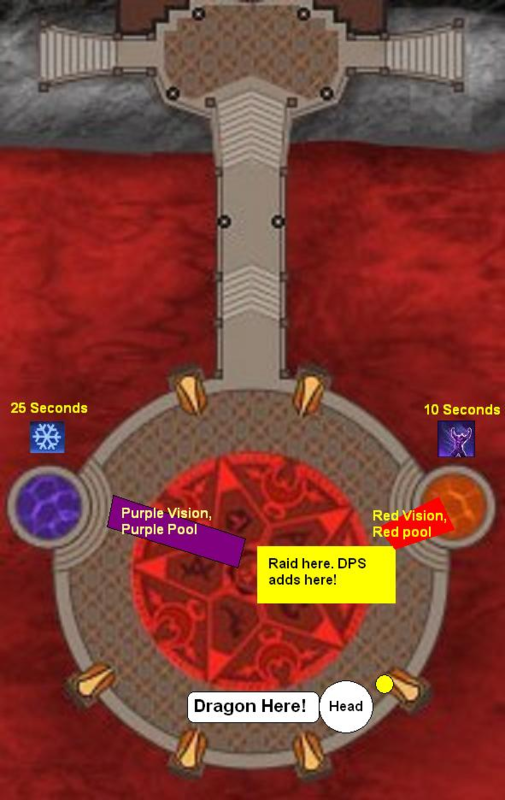 If you fail to make it in and out of the PURPLE pool before this time, you wipe the raid. 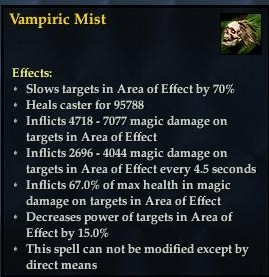 Spiteful Bloodcurse Grants Infravision (Red visition) when you recieve the effect. Your job is to make it to the RED pool (marked in the diagram below) within 10 seconds. If you fail to make it in and out of the RED pool before this time, you wipe the raid. 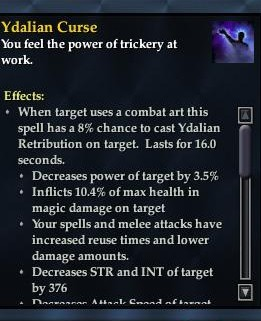 Please keep in mind that Spiteful Bloodcurse has a visual timer of 25 seconds, but the effect is misleading and the bloodcurse will 'terminated' after 10 seconds. 2 healers are required for each group to insure each group can handle the adds and pickup Zarrakon if required. The 'weakest' healer should be assigned to the group where the tank is unlikely to pickup Zarrakon. The tank responsible picking up the Wraith when it spawns and for picking up Zarrakon when the tank that has aggro gets a Wraith. DPS the wraith down and then DPS Zarrakon down. The faster you DPS down the dragon, the easier the fight will be. If you die, the door is 20 meters away, you can revive and run back if rezzes are down. Each group requires 1 tank 2 healers (different types, aka druid / cleric) 1-2 regen (different types, aka bard, enchanter) 1-2 DPS. 2 regen is preferred for each group to ensure all groups have enough mana to DPS. If 2 regen are not available for each group, then group power proccing gear my be beneficial for that group. This fight is not hard. It just requireds you to watch your detrimental effects, know where to run, and do your job in EQ2 effectivly. This page last modified 2009-05-06 20:09:53.